Caramel color is the most used artificial coloring in our food and drinks, but new research says that too much is not good for you. Artificial colors in foods have become a supermarket staple. Studies continue to show, however, that these ingredients may not be as harmless as they seem. Caramel color, found in many foods and drinks, isn’t benign by any means—some types have been found to cause cancer in mice. A recent study led by Consumer Reports says that levels of a certain chemical component of caramel color found in some popular drinks are far too high. Some types of caramel color contain a chemical ingredient called 4-methylimidazole, which studies have shown to be carcinogenic in mice. Called 4-Mel for short, it is included in California’s Proposition 65, in which products containing more than 29 micrograms per can or bottle must be labeled, indicating its presence. The California Office of Environmental Health Hazard Assessment established this cutoff point because this is the determined level that poses a risk of one out of 100,000 people developing cancer if they are exposed to 29 micrograms daily over a lifetime. Consumer Reports tested bottled and canned drinks, including many types of popular sodas, for levels of 4-Mel. The results were disconcerting, to say the least. They purchased soft drinks from both New York and California on two separate occasions, and while the amounts of 4-Mel went down over time, for the most part, two products—Pepsi One and Malta Goya—both exceeded this cutoff point during both rounds of testing at both locations. Additionally, the products purchased in California were not labeled as required. When contacted about the test results, PepsiCo stated that Pepsi One was exempt from labeling because government data states that typical consumer consumption of diet soda is 100 milliliters a day. Do you know how much that is? Less than a third of a 12-ounce can. Is their reasoning likely or realistic? Maybe not. As with any unhealthy food or drink, moderation is key. 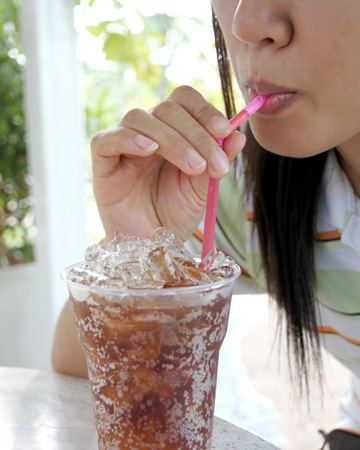 It’s unlikely that drinking an occasional Coke will cause cancer, but at the same time, you probably don’t want to drink tons of it daily for this—and other—reasons.